Bayley announced on Smackdown last night that she is now a single’s Superstar. 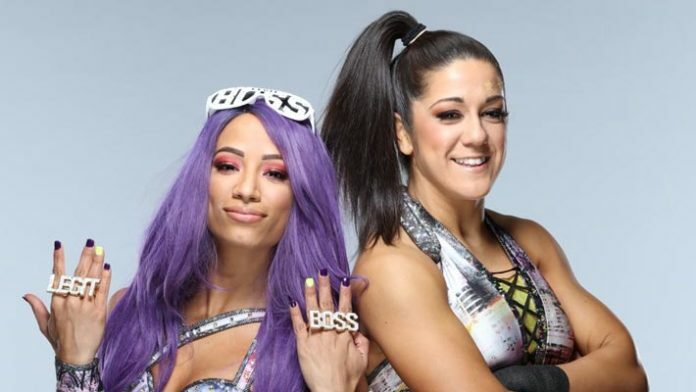 According to a report from Wrestling Observer Radio, however, the plan had always been to split up the Boss N Hug Connection after WrestleMania regardless of whether Sasha Banks was still an active performer with the company or not. “It was not only that they were losing the championships that they found out on Sunday but they were told they were splitting up the team,” Dave Meltzer said. Sasha Banks is not currently scheduled for upcoming TV appearances. WWE company has reportedly given her a couple of weeks to reconsider evaluate her future. They are optimistic she will return by the next pay-per-view, Money in the Bank. The Boss N Hug Connection would only hold the WWE Women’s Tag Team championships for a total of 49 days. They won the titles at the Elimination Chamber PPV in February and then dropped them to the Iiconics at WrestleMania 35. The Boss N Hug Connection defended the titles just once on WWE programming, defeating Nia Jax & Tamina at the Fastlane PPV. Including dark matches and house show results, however, Sasha Banks & Bayley defended the titles 14x within their 49-day reign as champions.